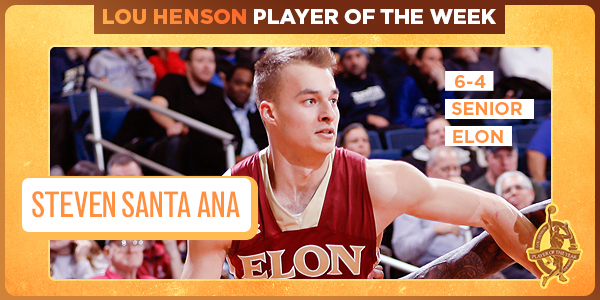 BOSTON (MA) -- Elon's Steve Santa Ana earns Lou Henson award national player of the week honors. The 6-foot-4 senior helped the Phoenix to a pair of Colonial Athletic Association road wins last week. On Thursday he had 20 points, nine rebounds, seven assists and two steals against James Madison. On Saturday he barely missed a triple double with 34 points, ten rebounds and nine assists. The 34-points was a career-high. Mid-Major All-Decade Team Copyright © 2019 CollegeInsider.com.